devoted the studio to in its early years. Sealab 2020, which debuted September 8, 1972 on NBC, was just another step in that direction. The setting was an undersea research and residential facility, where 250 people lived, worked and raised their families, a half-century in the viewers' future. The man in charge was Dr. Paul Williams, and his immediate subordinates included Hal, Gail and Ed, with a guy called Sparks, who handled communication with the outside world. The action started when Sealab personnel rescued a family whose boat had sunk above them. Mike Murphy and his children, Bobby and Sally, supplied the cast with what every contemporary Hanna-Barbera show needed — kids and pets (they had two sea turtles and a dolphin). Paul's voice was provided by Ross Martin (later heard in The Robonic Stooges and The Godzilla Power Hour). Hal, Gail, Ed and Sparks were Jerry Dexter (Aqualad in Aquaman), Ann Jillian (who mostly did face acting, including a supporting character in the Hazel TV series), Ron Pinkard (also a face actor, but lacking toon connections), and William Callaway (Ming in Defenders of the Earth), respectively. Mike was John Stephenson (narrator in Ruff & Reddy). Bobby and Sally were Josh Albee (mostly a face actor, with a supporting role in Isis) and Pamelyin Ferdin (Lucy in A Boy Named Charlie Brown). The characters and sets were designed by sometimes-comic book cartoonist Alex Toth (Johnny Thunder, Rex the Wonder Dog). Toth had done animation design work before, for example on Captain Fathom and Birdman. But this time, his work turned out to be considerably less durable then when he'd done Space Ghost or Thundarr. In fact, Sealab lasted less than one season. 16 episodes were planned, but only 13 got on the air. 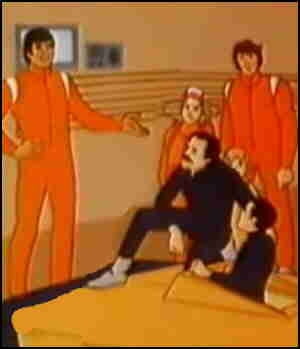 NBC was through with Sealab 2020 as of the 1973 TV season, and the show was never rerun elsewhere. No VHS or DVD editions have been marketed. But it does have a minor presence on modern television. Decades later, Sealab 2021 was aired on Cartoon Network (Duck Dodgers, Johnny Bravo), as part of its late-night programming block, Adult Swim. There, old episodes are cut up, rearranged, and re-dubbed to make entirely different stories, about entirely different characters, this time as a broad comedy. Voice talent on Sealab 2021 includes Erik Estrada (who's played Hispanic bit parts in Family Guy, King of the Hill and Higglytown Heroes), Kate Miller (Grace Ryan in Frisky Dingo) and Harry Goz (Perry White in a 1999 Superman video game). Hanna-Barbera has had no qualms about using the same footage multiple times, in multiple contexts. Thus, there are more than three times as many episodes of Sealab 2021 as there were of Sealab 2020. Text ©2008-09 Donald D. Markstein. Art © Hanna-Barbera.